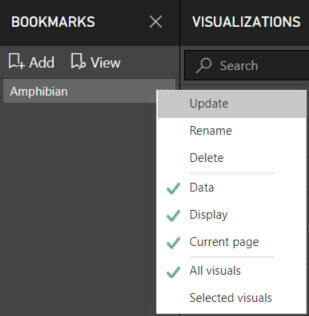 You can use bookmarks to take your reports to the next level - they take a while to get used to, as this blog shows, but they're worth the hassle! Bookmarks - What are they, and why should you care? 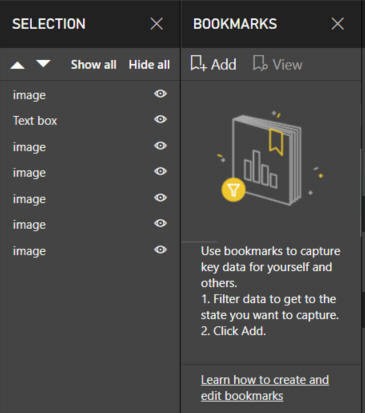 This page shows how to get started with using bookmarks in Power BI Desktop. Not to sound like the archetypal fuzzy-faced hipster, but I remember when there were only two boxes in here. The Selection pane allows you to choose which objects are visible. Handy when editing a very busy report: simply turn off the objects you don't want! On this page I have applied a page level filter so that only amphibian information is displayed. Double click or use ellipses to rename a bookmark. Click View to create a slide show of all the bookmarks. Update changes the bookmark to match the current page. 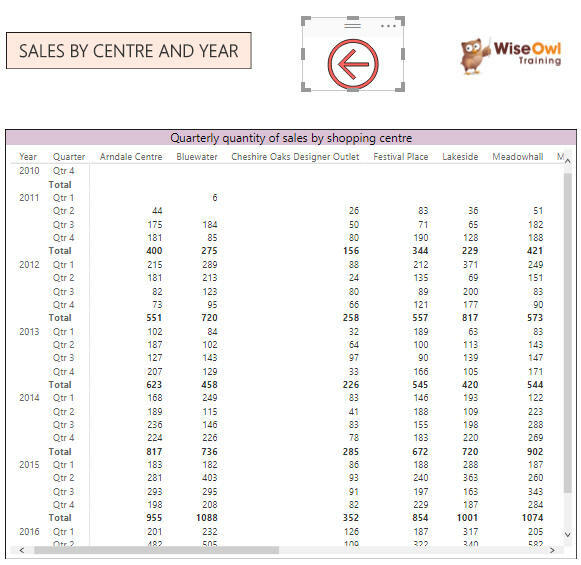 When creating a bookmark there are several options that can be saved: Data, Display and Current page. Data Saves all settings regarding the data on the current page (such as filter settings, cross highlighting from other visuals, drill downs on visuals and any sorting). 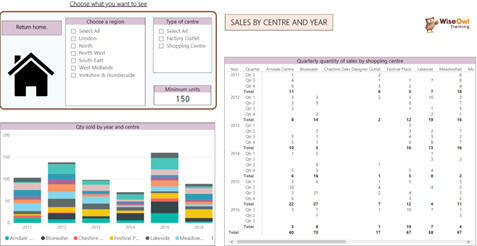 Display Includes spotlighting and the state of the visual in the selection pane (on or off). Current page This appears to stop access to the bookmark whilst presumably carrying over the filtering. Further investigation needed! All visuals The current states (chosen above) will be reflected on all of the pages' visuals. Selected visuals Only visuals that are selected when the bookmark is created will have their settings fixed. This is useful when you want one table to always stay the same. I've covered these options in more detail later in this blog. Choose an image to link the bookmark to. 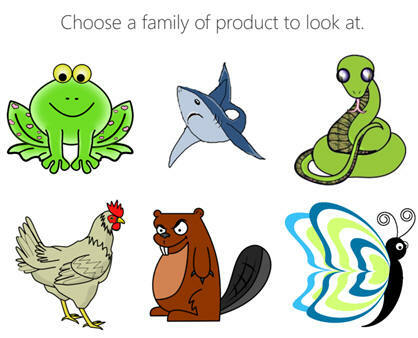 In this case I want to click on the frog and then look in the Format Image pane which replaces the Visualisation pane. Find the Link option and toggle it on. There are two choices under type: Back and Bookmark. Choose Bookmark, then select the bookmark of your choice. On this page I've added a bookmark to the home button - this will always take me to the home page. The shape I used is generated when you create a drill through report. I created a drill-through then cut the image to use here. Now you can spend all day moving back and forth between your pages! Currently textboxes can't have bookmarks. To get round this, overlay an object (such as a rectangle) on top of the textbox, then change the fill property to either clear or off.